Supported by dozens of examples. Thank you to those who helped launch our Kickstarter into production! THE FIPSY FPGA BREAKOUT BOARD IS NOW AVAILABLE FOR SALE!! Stay updated, and get everything you need to dive into FPGA design. FPGAs, or Field Programmable Gate Arrays allow a designer to rewire logic circuits at that hardware level, on the fly. This can greatly speed up processing or allow for massively parallel operations. FPGAs are described as a system designers ‘magical black bag’, in that they can be dynamically reconfigured to match any system. However, FPGAs are a mysterious topic to most DIY tech-types. Specifically, the barriers to entry are the large learning curves, high costs, and limited open source examples. We are building exactly the board we wished we had when we were learning about FPGAs. The Kickstarter will launch a supply of DIY-friendly FPGA boards. Funding will be reinvested in purchasing additional boards so that cheap FPGAs will be available to all future makers. MoCo Makers supports the learning process with step-by-step guides published on Instructables, Hackaday.io, our blog, and other places across the internet. 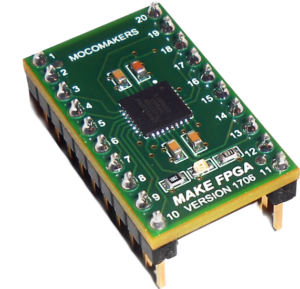 A very low price point for an introductory FPGA board. Other boards are closer to $60, which is too much of a price barrier for non-engineer/hobbyist. We are closer to $12. Started in June 2016, MoCo Makers is a rapidly growing community of over 1000 Makers. We promote self-development and hands-on creation of ideas, prototypes, and physical creations. We host regular free events on topics ranging from introductory electronics, to machine learning, to commercializing prototypes, and more. While open to all skill levels, we have a solid core of technology experts that are pushing the boundaries of tech entrepreneurship. All our projects are collaborations among our community members. We bring skilled engineers, serial entrepreneurs, developers, and designers into every product we produce. We are proud to help hobbyists scale up big ideas.